The museum of Arkhangai province was established in 1947 by the name of "The place to study the community" in the palace where Zaya Bandidas (great lamas) of the Khalkh Mongolia (main tribe of Mongolia) lived in the 17th century. The museum has rich collections of historical, traditional and cultural exhibits of Arkhangai province from the ancient time to these days. It has 6 exhibition halls such as historical, religious, handicraft, ethnographical, and etc. In the historical hall there are Mongolian historical exhibits that are related to the stone age, the bronze age, the Hunnuh State, the Tureg State (ancient Mongolian States), the 1 h century and 19th century. For example, the unique and valuable bronze bridle (Ill-I thousand years of BC) and the lighted wolf-shaped monument (6th century of the BC) are historical and cultural exhibits of the Mongolians . The ethnographical hall has being and mental items of the Khalkh tribe: ger, deel, women accessories, games, musical instruments, and livestock equipments. For example, there are a state big harp (13th century), a fiddle (19th century), best andartful creations of Dalai Choinkhor (an ancient soum of the province) craftsmen, special things that Zaya Gegeen (a great lama in Mongolia) and the King Namnansuren (a king of one of the ancient 4 provinces) used at their time. Zaya Bandidas and lamas used. These items are paper god images, molten things, gold gilt, carving, and god images with traditional and artistic design. 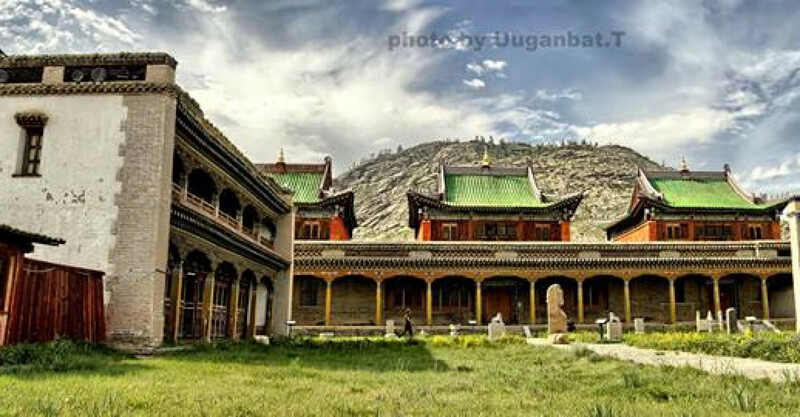 The Guden Temple of Zaya Gegeen (dead body of Zaya Gegeen is kept here)was built in 1696, and the Right and Left Semchin Palaces (camps where lamas stayed) were built in 1802. In this complex, Zaya Bandidas stayed and prayed from generation to generation. The buildings contain Tibetan and Chinese design and made by Mongolian craftsmen. It is one of great and unique memorials of the Mongolian architecture.